MAKING CONTACT WITH THE PRIEST WHO WILL CELEBRATE THE MARRIAGE – Couples are encouraged to marry in the Parish Church of either the man or the woman, preferably with one of the clergy of that parish acting as celebrant. The Church’s Pastoral role emphasises the importance of preparation for marriage within a faith community. You should make contact with one of the Priests as soon as possible after your engagement, allowing 12 months prior to the date of your wedding to make arrangements to meet him and begin your preparation. The Welfare of the couple should be given priority. WORKING WITH THE PRIEST – The Priest will want to meet you several times – to get to know you, in order to make the celebration of your wedding as personal and memorable as possible. He will want to help you use the time leading up to your wedding well, to prepare for a really good marriage. He will assist with sharing an understanding of the Catholic faith, where there is an interfaith context for the marriage. He will also assist you in preparing the ceremony for your wedding. Note Also: Priests from other parishes are welcome to perform marriage ceremonies in this parish. Any necessary dispensations are given. The fee payable for a wedding is $400.00. This includes a $30 fee for FOCCUS a pre-marriage program, church use and Priest’s stipend. This money is not for the personal use of the Priest but goes towards the support of priests and living expenses. A reduction of $100.00 is made for parishioners who are recorded as regular contributors to the Planned Giving Program. Payment for the Priest’s Services – $175.00. A deposit of $100 is payable at the time of booking and will confirm your booking. Balance to the paid one month prior to the wedding date. In relation to the above fees it should be noted that: – Civil Celebrants charge approximately $350.00 for their services. 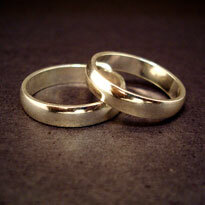 A Priest spends much more time with the couple than a Civil Celebrant and should expect a similar payment. It should also be noted that the Priest does not receive the fee personally. The amount given is paid into a fund for the support of all Priests of the Diocese. If you have chosen a Celebrant outside the Hamilton area, this clergy fee, as well as the booking fee for the Church still applies. (It is proper to offer remuneration to the visiting priest, ie: travel plus offering). MUSIC – Payment is by arrangement with the singer and musician direct. The church tape or CD player is available, a fee of $25 is required to have a parishioner attend to the tape or CD player. Couples are expected to attend the pre-marriage FOCCUS program currently being run in the parish. The priest will give the couple information regarding the program. Church Music – We believe that the choice of music for the Marriage Ceremony ought to express and enhance the Christian vision of marriage. The ceremony should be dignified and prayerful. Check your choice with the priest. Wedding Booklets – If you intend to print a wedding booklet a draft is to be shown to the Celebrant before printing. Church Flower Arrangements – Floral arrangements, pew decorations, etc in the church are your own responsibility. You are welcome to have simple arrangements of flowers. These may be placed on the two church pedestals at the rear of the sanctuary, or in front of the altar or lectern. Church Flowers can be arranged and provided by Mrs Ilma Underwood, 73 Digby Road Hamilton. Phone: 5572 3383 for a fee of $100. Candelabra – Only the candelabra belonging to the church may be used. These are two 7 candle branched candlesticks. Hiring fee is $40. White candles can be provided, or your own coloured ones may be used. We encourage you to participate well in the preparation for your marriage. You are expected to give this priority over other commitments. Confetti, flower petals, rice etc.- These are not to be used within the Church grounds. They cause too much mess and can find their way into the interior of the church. Photographs and Videos – Apart from the entrance, the signing of the register and leaving the church, photos or videos are to be taken by the official photographers only. Numerous photographs during the ceremony can be intrusive and distracting from the sacredness of the moment. In view of the large number of people today who are unemployed, homeless and hungry, you may consider donating a little to the St Vincent de Paul Society. You may arrange this through the priest. It is a way to thank God for your bounty of love and friends. Let it represent the concern and kindness you would like to see in your own marriage. Prepare for your marriage, not just your wedding! Marriage is the most challenging, complex and yet rewarding commitment two people can make to each other. Preparation is essential in making such an important life choice, with research showing that pre-marriage education significantly improves the chances of a successful relationship. to focus on personal, couple and family goals. Centacare Warrnambool offers couples private relationship education sessions. For more information contact Centacare on 5559 3000 Family Relationship Education Services Level 1, 142 Timor Street WARRNAMBOOL 3280.